Students in Barbara Mosny’s second grade class at Fairley Elementary School connected via distance learning with Dorothy Stinson School in Safford, Ariz., recently for Read Around the Planet. The videoconference was part of a distance learning initiative between Oswego County BOCES and the Hannibal CSD. 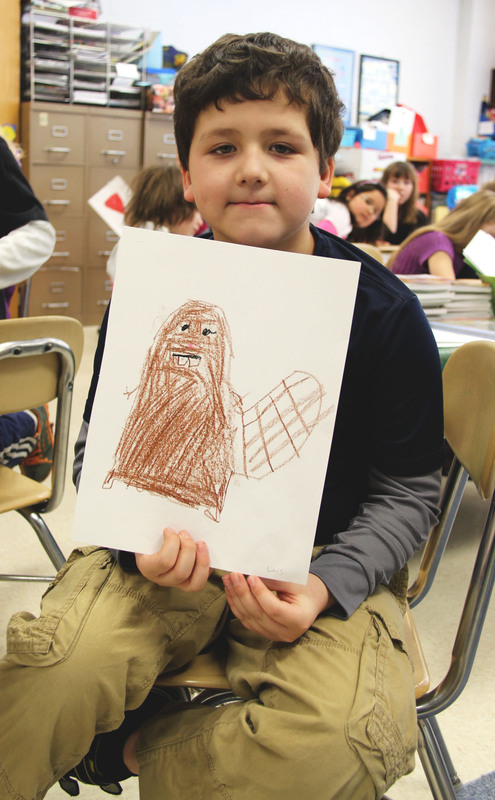 Pictured is Luis Munoz with his drawing of the New York State Mammal, the Beaver. Prior to the videoconference, Mosny’s students researched facts about New York State and drew pictures illustrating iconic places, including Niagara Falls, the National Baseball Hall of Fame in Cooperstown and the Statue of Liberty. In sharing information, students learned about their own state capital, flag, motto and flower. Each class took turns sharing information about their community, and were surprised at how similar they were given the 40 driving hours between them. Students also saw a bird’s-eye view of each other’s schools through Google Earth. Mosny shared with Dorothy Stinson School a photo of Lake Ontario nearly frozen. Many of the second graders had never seen snow in person before. In a question and answer portion of the videoconference, Hannibal students learned what the second graders from Arizona like to do in their free time, their favorite instruments and subjects in school. Physical education was a favorite of each school. Mosny will use her class’s illustrations to make a book for parents to browse during conferences later this month.